Want to spice up your old kitchen cabinets? Instead of replacing them, a more budget-friendly solution is to repaint them. 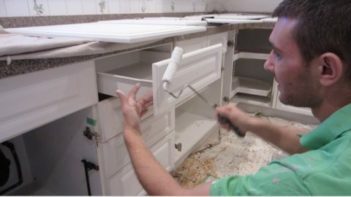 Here are fast and easy ways to paint your kitchen cabinets like a beginner and get pro results. To identify whether paint can adhere to your cabinets, lightly sand them first. If they can be scraped, they can be easily repainted. However, remember that stained wood and glossy finishes have to be de-glossed first. Instead of using cheap paint that will require you to repaint frequently, opt for a high-quality one that will last for a long time. For water-based paint and latexes, consider using products from Benjamin Moore. For easy-to-clean cabinets, use acrylic paint. As for the type of finish, semi-gloss or satin finishes are typically used. When selecting your kitchen cabinet colors, remember that they should be chosen based on how they will visually affect your space. Paint can be applied by spraying, rolling, or brushing either with a bristle or foam brush. To identify which is the most suitable method, consider the amount of woodwork, type of paint to be used, and your own working style. Begin by emptying the cabinets and cleaning them thoroughly. Remove handles, hinges, and other freestanding equipment out of the way. Label them for easier reassembly. Make sure that the room is properly ventilated before painting. It is also advisable to wear a mask while working. Cover the fixed areas that must not be painted on. These include countertops and appliances. Then, lightly sand the portions to be painted for better adhesion. Once the cabinets’ surfaces are clean, apply an even coat of primer to guarantee a well-adhering finish coat. Start by painting the insides and openings, the outer sides, and then the doors and drawer fronts. Paint separate pieces or moldings last. Always thinly apply coats since they leave fewer visible brushstrokes and dry quickly. Each coat must be allowed to dry for at least four hours. Before applying the second coat, lightly sand the surfaces again. Two coats of paint are typically applied. However, a third coat is recommended since kitchen cabinets must be protected from heat and moisture. If you want a full kitchen makeover, you can breathe new life into your old kitchen hardware by spray-painting them. Finally, reassemble everything you removed before painting the kitchen cabinets. Aside from repainting your kitchen cabinets, you can install shelf liners, under-cabinet lighting, or a new backsplash to update your kitchen. Hopefully, you enjoyed our Kitchen cabinet painting tips. Home improvement projects usually cost a lot of money. Fortunately, with simple, easy, and budget-friendly tweaks such as kitchen cabinet painting, you can dramatically transform your space with minimal effort.